I wasn’t sure what to expect of his book, then. Well, truthfully, I expected more of the same financial information every other personal finance books has ever regenerated. But this book was different. Way different. In fact, it was one of the most interesting books I’ve read this year, but it gave me little, if any, new financial knowledge. 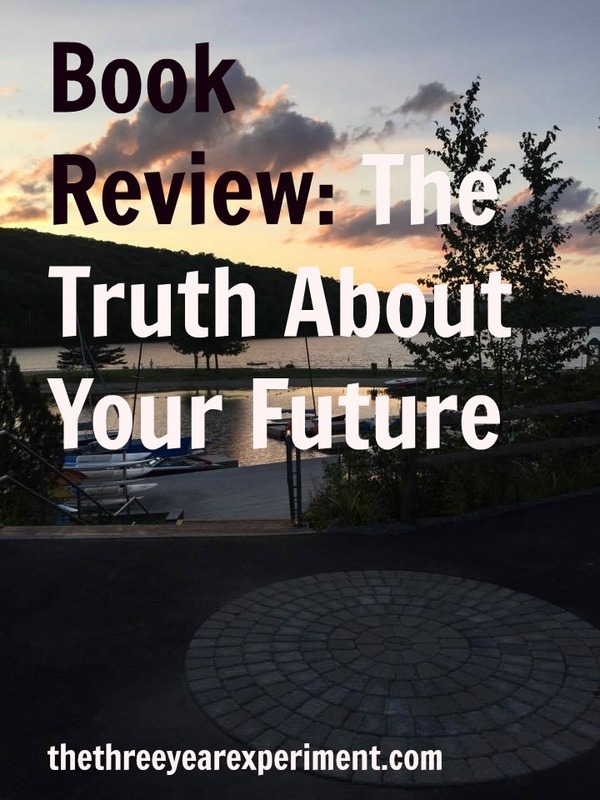 The Truth About Your Future is a book about exponential technologies and how they will radically alter life as we know it. Edelman is a graduate and guest lecturer at Singularity University, located in Silicon Valley. He has been touring the country for the past seven years, giving talks about new technologies and how they’ll change financial planning as we know it. In the Prologue, Edelman introduces the famed law of exponential technologies, Moore’s Law. Intel cofounder Gordon Moore noticed, back in 1966, that a computer’s speed doubles while it’s price halves every two years. The law has been updated to reflect the new reality that this actually happens every 18 months. The book: my copy from our local library. So Watson, the famed IBM computer, was the size of a living room when it beat Jeopardy champions Ken Jennings and Brad Rutter in 2011. Now, it’s the size of about two suitcases and way more powerful. The implications of Moore’s law are that computers will eventually be measured in nanometers (one billionth of a meter), so small that they’ll be easily implanted into human veins (what? Does this sound unbelievable? Look up Dator’s Law, also essential to understanding exponential technologies). Edelman also explains exponentiality–the doubling and doubling again of technology, which has astronomical implications: “Exponential growth is how the 2016 iPad Mini was able to have 50,000 times more computing power than the 1986 space shuttle.” Compound interest is exponential, too. Hence, the shocking penny experiment: a penny yields you more than $10 million after 30 days, when you double it each day for a month. The book is divided into halves. The first half, Part 1, is called “A Tour of Exponential Technologies.” Edelman explains The Compound Growth Curve of technology. Just like the penny experiment, where you watch faithfully for something to happen, but you’re still at relative beans by day 21ish, where it’s only worth $10,000. Almost all of the growth happens in the last week of the experiment, when the compounding starts to take off like a rocket ship. If you drew a curve on a spreadsheet, this is the moment when your basically flat horizontal line suddenly curves skyward and becomes vertical. We are, Edelman explains, still in Week 3 of the growth phase. Our technological line has barely started to curve upward. “Exponentiality explains why the future will arrive fast–and why you don’t realize it. You’ve been watching that penny every day for three weeks, and nothing much has happened. So you assume the fourth week will be the same. 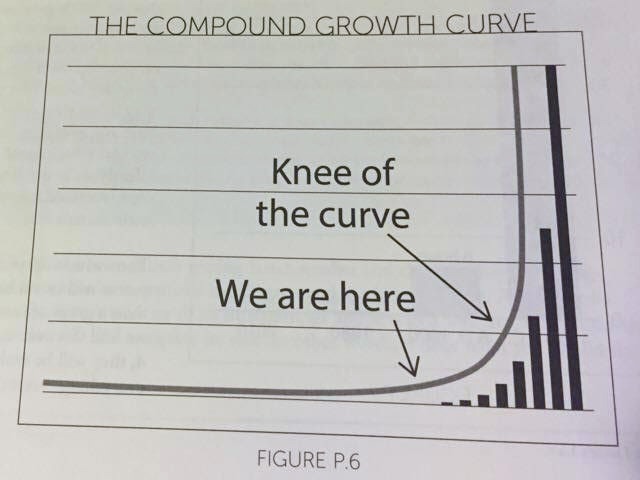 Only it won’t be.” This place is called the knee of the curve. Despite the fact that we’ve experienced a mind-blowing pace of technological innovation over the past 10 years, we haven’t even seen exponential growth yet! The implications for our world are enormous. By the mid-2020s, PCs are expected to match the speed of the human brain and by 2030, PCs are expected to have processing power that approaches the speed of light! And retail for $1000. AI and machine learning are just at their infancy as well. Currently, a robot built in Germany taught itself to make pizza by reading Wikihow. Other robots taught themselves to build robots, and got exponentially better at it over time. And we’re at the knee of the curve, here. Meaning, robots and computers are in their infancy. Think of all the changes that have happened in the last ten years. Heck, the last five. In 2007, the iPhone was invented. Check out Time’s 2007 inventions of the year. They look downright dated. This robot, the invention of the year, can grasp people’s hands and place objects on tables. Think how much they’ve developed! Now robots are used as stock room workers, bartenders, and pharmacists. In 2010, I was reading a book on a first generation Kindle when someone behind me remarked, “That’s the coolest thing I’ve ever seen. What is it?” 2010. Eventually, computers will be so intelligent that they will be indistinguishable from biological intelligence. This event is called “The Singularity” and it’s probably going to happen in our lifetimes (if this seems crazy, see Dator’s Law). Chapter Three, Robotics, shares information on robots that already perform your job better than you. “The da Vinci robot performs half a million surgical procedures annually worldwide, with 80% fewer complications and faster recovery times.” The military uses robots to track, protect, assist, and even kill soldiers on the battlefield. Drones are becoming ubiquitous, even being used to fly into hurricanes and tornadoes. Then there are SDVs–self-driving vehicles. “McKinsey estimates that self-driving vehicles will eliminate 90% of all car accidents.” That also means parking won’t be necessary, as SDVs will be busy piloting others or driving off to a remote location. The implications for your finances are monstrous–your field could be replaced by robots. Chapter Four details Nanotechnology. “The American Society of Mechanical Engineers says that nanotechnology ‘will leave virtually no aspect of life untouched and is expected to be in widespread use by 2020. '” That’s three years from now. We’re talking about computers that are the size of a single nanometer, that can travel your body as individual blood cells and repairing diseases and sickness. Graphene is a material that’s just been created, is made of graphite, and is a single atom tall. It’s strong, flexible, and almost completely transparent. It will be used in the future to create long-life batteries, create body armor, repair spinal cord injuries, and eliminate toxic spills. Venture capital funding in nanotechnology surpassed $1 trillion in 2015. See related: Bitcoin Trader Pro Site. Subsequent chapters detail unbelievable technological advances in 3D Printing, medicine, the environment and energy, education, leisure and recreation, and financial services. In general, Edelman strikes an optimistic tone about these life-changing technologies. But he spends one chapter on “The Dark Side,” that is, the dangers of these technologies that we may have to contend with. For example, “self-driving vehicles will cause the loss of millions of jobs–and not just those of cabbies and truck drivers.” With SDVs, things like parking valets, toll booth operators, driving schools, and car rental companies become obsolete. To say nothing of the auto insurance industry. The second half of The Truth About Your Future details the financial plans Edelman believes you’ll need for now, later, and much later, given that he thinks we’ll all live much longer thanks to advances in nanotechnology and medicine, probably 120 or so. Edelman predicts that retirement won’t exist in the future (well, he predicted it wouldn’t exist in the 21st Century back in 1997. Guess he was wrong there). He believes that prices will fall and savings will grow for older people, meaning that as long as they’ve invested wisely for the middle term, their savings should last them through the longer term. 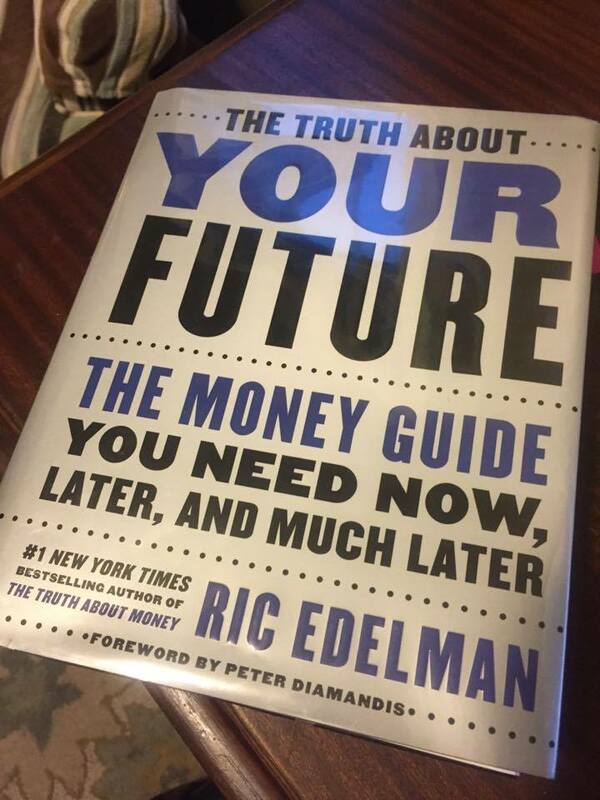 Edelman is a personal financial advisor, and owns one of the country’s largest financial planning firms, so maybe this is why, despite the fact that his book is filled with details about life-changing technological advances, his financial advice feels stale. Which investment strategy should you adopt for the future? How about the stock market, with some bonds and real estate thrown in (it’s important to maintain a long term focus, he says). Let his firm rebalance that portfolio for you, or you could do it yourself, if you’ll spend enough time on it (one of his strategies is to rebalance each and every day). His financial advice isn’t bad, per se, it’s just the same advice I’ve been reading for decades. Also, he writes to an audience who he assumes is not financially sophisticated. It strikes me as odd, if that audience could power through the first part of his book, that they would be the financial neophytes he assumes. The one chapter I did feel offered practical advice was the long-term care section. My father recently asked me for advice in this arena, and I was glad to see that Edelman agreed with my ultimate assessment–if you’re currently 65 or younger, you probably won’t need LTC, which has become astronomically more expensive and pays out less. It’s better to self-insure. Finally, he reminds us that as we age, we’re likely to be having more fun, happier, more relaxed, more content, and less anxious. 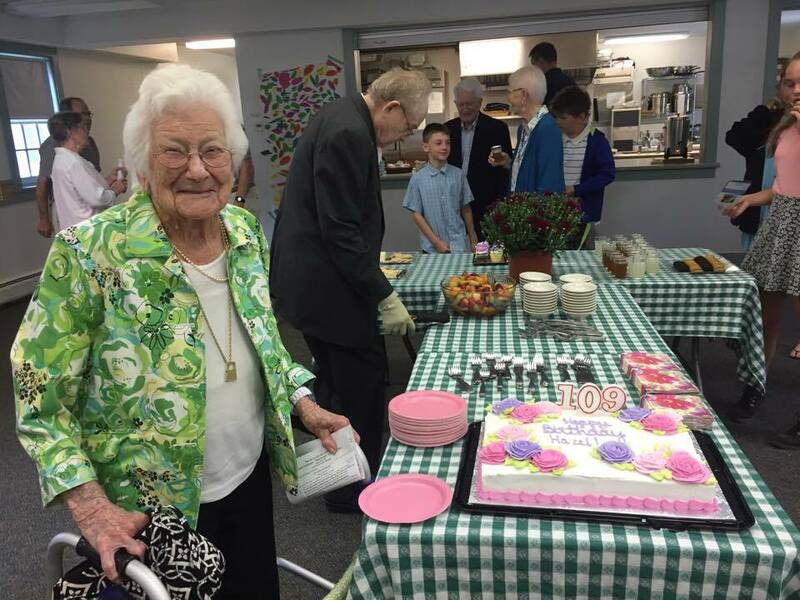 This lovely 109-year-old lady from my church is having a ball. Should you read this book? I recommend that you read Part I. It was a compendium of transformative technological innovations, and it changed how I view the coming future. Edelman succeeded in giving me a glimpse of just how transformative the technological “curve” will be in the coming 5-10 years. Part II lagged behind Part I in showing me a transformative financial plan for this technology. But I think that’s a difficult task for anyone. Predict the future, and give people investment advice for it! My takeaway from Part II is that I will continue to save and invest, while being flexible to the possibilities of the future, like a future with only SDVs and no auto insurance. What’s the craziest thing you’ve heard lately about technological advance? I’d love to hear!